This happened with the recent xorg update (2014-09-12). [ 12.327] (II) Module vboxvideo: vendor="Oracle Corporation"
The virtualbox driver isn't loading, and it looks like you dont have virtualbox 4.3.14-dfsg-1build1 which is the one that works with it. Is the update available to you? That's what I have installed. I tried a lot of different combinations. In the end it only worked when I had virtualbox-guest-x11 installed on the guest. -dkms and -guest-additions-iso didn't make it work. I can confirm this on todays daily build. After rebooting a fresh Install of Utopic on Virtualbox I get resolution 640x480, no changes happen if you reinstall Virtualbox guest additions. Resolution in the live session is fine, it is only after booting to the installed system that it degrades to 640x480. Installed virtualbox-guest-x11 package in Ubuntu Utopic 14.10 final guest and got normal resolution in it. This is still present with the daily build for 11 Dec on Ubuntu Gnome. This is still present with the vivid alpha 1 image for Ubuntu Gnome. Additionally with LVM encryption, the text is cut off on the left and the right as well as the input box being slightly cut off at the bottom. The virtualbox drivers used to be included on the live CD, that doesnt seem to be the case anymore however. 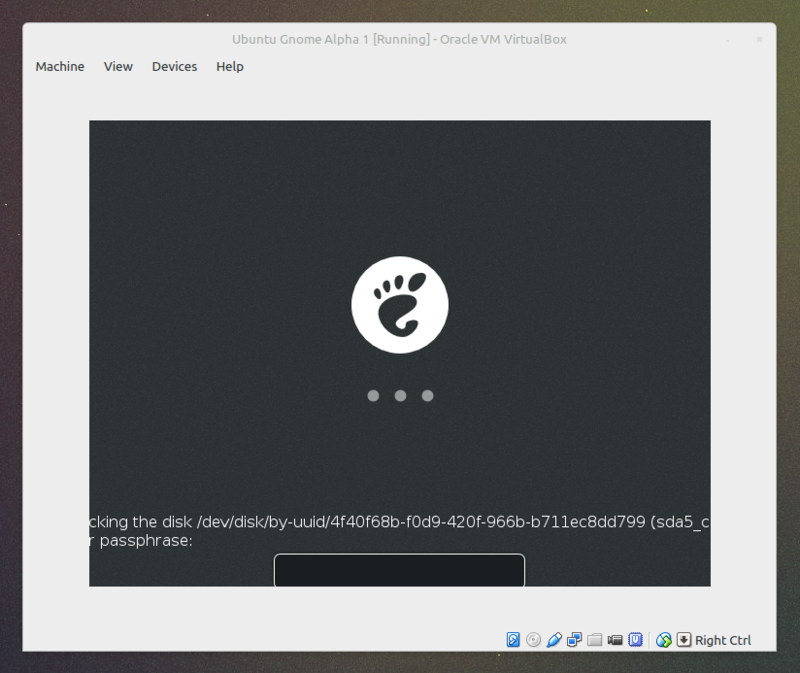 Also affects Ubuntu Gnome 14.04.2 with 20150203 build. amijawad's solution three posts up fixed the issue for me. (And https://bugs.launchpad.net/ubuntu/+source/plymouth/+bug/1386005 as well). After discussing this with Colin Watson in #ubuntu-devel I've found a work around that is more agreeable. Run the following to update the blacklist and grub. The boot process will now be text only for Virtualbox guests and the default X resolution is 1024x768. <flexiondotorg> cjwatson is prepared to update grub-gfxpayload-lists if someone here can confirm "fixing" this issue at a kernel level is hopeless. <apw> flexiondotorg, "fixing" at the kernel level, do we know what the issue is ? <flexiondotorg> apw, So the issue is the default resolution when virtualbox-guest-x11 is not installed. <apw> the default resolution is that offered by the vesa settings i assume ? <apw> ok, so then it sounds like whatever this is using now is a candidate for blacklisting ? <flexiondotorg> apw, Must be. vesa is used by vbox when the guestadditions-x11 is absent. <flexiondotorg> apw, Since 14.04. Yes. <flexiondotorg> apw, The 640x480 thing started sometime during 14.10. <flexiondotorg> apw, It is odd because when booting from the live media, resolution is 1024x768. <flexiondotorg> But on first install, resolution is 640x480. <flexiondotorg> So, possibly a regression in what Virtualbox provides. * Skip various backup files (LP: #1136592). The fix is that the resolution will be 1024x768 (max)? could actually use the virtual installation. > The fix is that the resolution will be 1024x768 (max)? Thanks @John P. Resolution in the 20150422 build of Ubuntu MATE is 1024x768. I'd prefer that it be able to go full screen like with past Ubuntu releases, and think that would be a true, final fix. That's the question for the folks working on this - what's the intention?